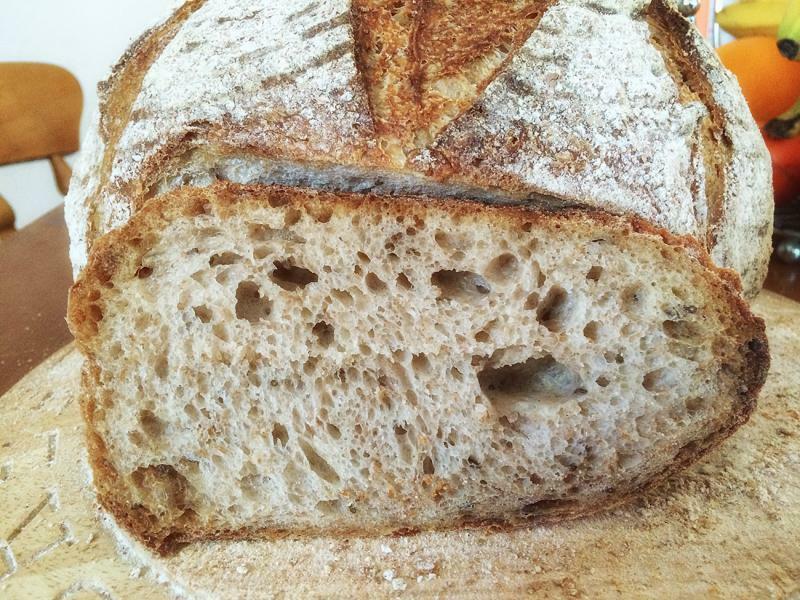 I mixed the stiff Starter with the Water, added all the flours and caraway seeds and mixed it until well combined. Added Salt, gave it a turn in the Bowl, covered the bowl and let it sit for 30 Minutes, gave the dough the turns again, let it sit for 30 Minutes.. I did those turns 6 times , every 30 minutes for 3 hours. Between the turns I put the bowl in a plastic bag. Bulk fermentation for about 6 hours and final proof in banneton for 2 1/2 hours. Oven was preheated to 250C with the Dutch Oven in it. I baked the bread for 40 Minutes at 250C and a further 30 Minutes at 200C without the Lid. Since we are a family of 6 and we all love Sourdough bread and , well, bread... I have to start the next one tonight. Awesome! Great looking loaf! Would you mind if I featured it on the homepage for a bit? So happy you like it. Looks lovely Petra. I can only imagine how tasty it is. Wish I could have a slice! This is a very yummy bread, it is my fav. now, it has so much depth to it. Next one is bulk fermenting already. Thank you so much dabrownman, I believe it is not only the hydration that makes the holes but also a very light hand while working on a loaf of bread from start to finish. I think a light touch is key too. This is why no knead is so popular - no worries about heavy hands and you still get holes - but it tends to be a very wet dough to compensate for the not working the dough at all ! You have a nice of just perfect for just about any kind of food being served. I love no knead bread. I find it so much easier when working with a dough that has a lot of whole wheat and rye in it. Tomorrow we have the bread I am baking in the Morning and I serve it with a green bean soup and Frankfurters. I just love to dunk bread in soup. We are moving house at the end of the month, I shall have a Range Oven, I can bake more than just one bread at a time. Just hope I get to terms with the new Oven, I am so used to my old one. and the new oven! Every time my wife wants to move....which is more often now a days, I tell her I hate moving and would rather slit my wrists and lay down in the gutter. She just asks if she can help with that:-) Nothing like a good question. Petra that is beautiful! Your family is spoiled and you are so good at it! I just love bread so much. That's a beauty and I can see why it was gobbled up! Thank you Eli, it was very tasty , all gone, next one goes in the Oven soon. It will be the last one I bake in this house, since we move soon. 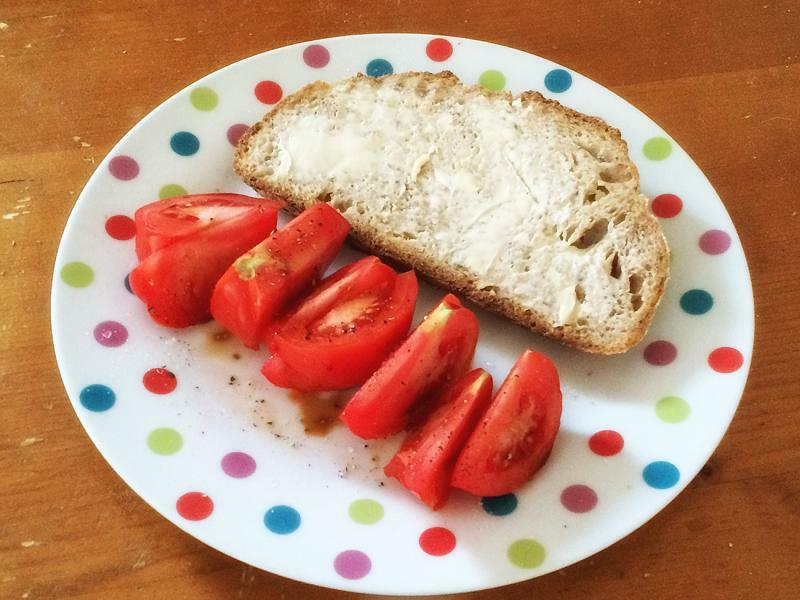 It was very very delicious, no other bread can compete with a good Sourdough. 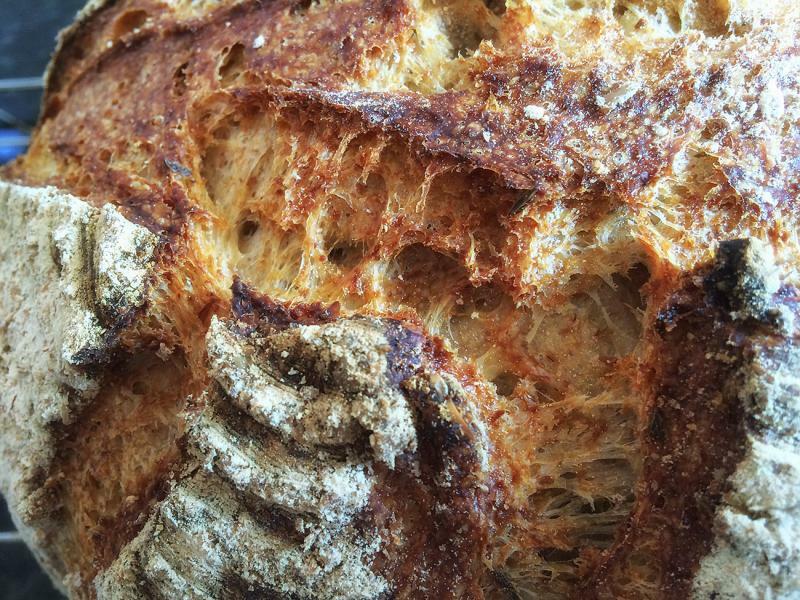 Looks fabulous, great crumb! Fellow insomniacs unite! I'm also with you on the caraway, never too much for my taste! Great bread! Yep, Insomia at the moment BUT I can always spend the sleepless Night mixing Dough for the next bake. Try and get some sleep though I know you will most definaley dream of levain! Thank you so much ghazi, we love this nutty kind of taste that comes from the whole wheat and rye. Congrats on making the front page! I think you will handle the moving just fine. Don't forget your oven thermometer! :) Are you moving far? Oh I shall NEVER forget my oven thermometer, one of the most important tools. We stay on the Isle of Wight and moving about 20 km away from where we live now. The Landlord wants to sell this house, which came as a shock to us, without warning. We where lucky to find a beautiful place that allows pets as we do have a golden Labrador , a Border Collie and 2 Cats. The kitchen in this house was already very old when we moved in, so was the cooker, but one get's used to it. that the shortest moves break the most dishes. Has something to do with the common notion that they won't get a good shaking up, but they do. Borrow some wine boxes and use sturdy containers and cushion each plate. (Unless you want new ones. :) I always have fond memories of using stacked up paper towels and wrinkled napkins after a move. ..and if you break a few... we have a saying here that "Shards bring Luck!" That close up shot, crunchy crispy split scoring is so tantalising, my mouth is watering out of control. Guessing that the last and first thing baked in both ovens will be bread. Lucky moving helpers! Question though -- the salt seems to be rather high. I think it comes to 4% of the flour. Is that because of the whole grains and caraway or is it just a more salty than usual loaf? Used my iPhone to take the pictures, it is easiest. I made a few of those size loafs and I adapted the Salt content as less does not really come through. Now I am curious lol. How do you do the math? i see that I was calculating off of 100% hydrated starter. But, if it is 250 grams of 50% hydrated starter, to get the flour in the starter is the math 250/1.5=166 grams flour and not 175? (more practical) and 85g of water for 50% hydration. If you add up 170 and 85 you do have 5 g more, for practical purposes 5 g is not a lot and does stick to the jar and spoon and a lot easier to read on a spring type scale. (not everyone is digital) And some of the water evaporates while it is maturing. Divide 85 (water) by 170 (flour) and it is exactly 50% hydration. I am totally lost now lol, I just do not get the hang of that Bakers %. darn it lol. Do I deduct the flour and the water in it from the flour and water the recipe calls for. Since I am baking so much during the week * family of 6 wants a lot of bread * I do always refresh my 200g Starter with 200g of flour and 100g of water. If I was not baking so much I would only keep a small amount, but doing it like this is more convenient. I just do not have the time for the 3 stage builds and such, it might get better once the 2 older boys move out, they are looking for jobs now after University. Maybe I am just to tired from not enough sleep. we were just figuring the flour for the recipe and how the salt relates to it. You still come out on top. You take 200g and add 300g (to get 500g stiff starter) (2:2:1 S:F:W) and then remove 250g ripe starter for your dough leaving 250g to reduce or feed. If you measure out 200g ripe starter everyday to feed then it'll be fine. If you don't measure the starter before feeding, then it is growing 50g more each time it's fed. If you wanted to rid yourself of that extra 50g, you could feed 170g flour and 85g water instead. Then there is no extra, not really true, there is 5g extra but that is not worth talking about. It get stuck on the spoon and sides of the starter jar and some of it evaporates. Weigh it now and again if you want to check on it. I weigh out 200g of Starter and feed again with 200g floru and 100g Water for next baking. The thing is, I like to use 250g of Starter for my breads but since I feed 200g of Starter , ratio 2:2:1 and take 250g out, I do not have 200 left to feed again, it is less than 200g , can I still feed that with 200g of flour and 100g Water or would it be off ballance? I confused myself now lol. Soooo, if I have weight out 200g Starter and want to build it up to 500g Starter to have all the time for baking, how do I get about that. feed 200g starter to make 500g 50% hydra. You do what you have been doing, add 200g flour and 100g water for a total of 500g. You could also round up and use 200g water and 400g flour if that is easier to remember, then you have added 600g flour & water to 200g starter, it will take a little more time to ferment and peak but then you can make two loaves if you use 250g starter for each. That would change the feeding ration from 2:2:1 (s:f:w) to 2:4:2 doubling the feed in other words. If you want to feed at the same ratio of 2:2:1 then you need to start off with a smaller amount of starter. I think I will try that, but once the move is over and I have more time on my hands again. Today I bake the last SD bread in this house and put the starter in the fridge. I can not wait to move!!! 100% hydration means equal weights of flour and water. 100 grams flour and 50 grams water. how much flour in 350 grams of the 50% starter? 350/1.5. Easy. Sorta. If your formula normally does not use a starter and you decide to use one then I believe you deduct the flour and water from the formula to build the starter ( or reduce the flour and water if you already have the starter built). Otherwise just follow the formula. I believe if you are scaling the formula you scale everything including the starter. been away from it for a whole year. I put in my chicken wings and turned it on. It lit up and buzzed with excitement. Me too! After about 45 minutes I checked on them, nothing was happening. Didn't even feel hot. I opened the door and put my hand inside. Now why was it not hot, was my oven broken? I checked the dials, 200°C (good) fan (yup) and ... just fan... oops! no heat! Needed fan and bold line underneath! I was so hungry! finally got the heat on and then had to distract myself from eating my wood pile. I'm sure glad I didn't let a loaf overproof in a cold oven! Our weather has turned cold, thinking about baking again... 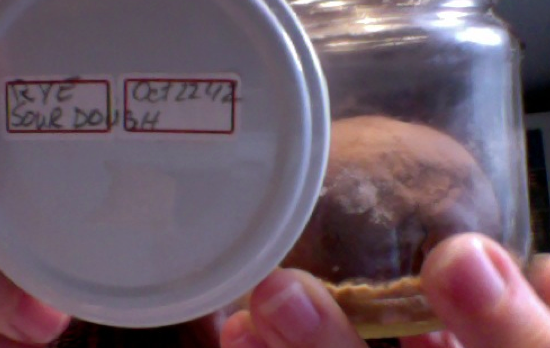 Here's a photo for you... took this today: very firm starter 22 months in the refrigerator. Now to activate it! Put into hibernation October 22, 2012 It is dark but pretty much blemish free. By the way, slept poorly last night, too many weather changes. Oh, I did chop down a tree today and cut it into logs to dry. wow, you been busy chopping all that wood. I have gone down in hydration for my Wheat Starter from 50 % hydration, but just a small bit, I fed only 10g less water when I fed it, but it got so soft and sticky when I took some out for baking. storage in the fridge (and for travel take along) I give it less hydration, closer to moist crumbs that just barely hold together. I take a tablespoon of active starter, add a tablespoon of water and then pinch in rye flour until it is dry enough. This usually give me 2 or 3 golf ball size starters. It should still pack into a tight ball but be dry enough to fall apart into crumbs (not just crack) if squeezed. Roll in flour after shaping and add about a tablespoon of flour to the bag or clean jar to keep the outside dry. I tuck one ball into my fridge (burp it after a day) and then take the others with me if I travel. They start to ripen at room temp but due to low hydration, it takes a few days so I have plenty of time to organise a kitchen and source flour before feeding again. If the balls should go soft, then I know I have to feed them sooner. With extra samples, one ball usually stays intact as "back up" while I work hydrating another. I'm sure it is much lower than 50% and now it smells very sour. The plan is to cut off the thick darker protective outside, the first line of defence, and throw that away with the little bit of flour in the bottom of the jar. (I use that to keep the dough ball on the dry side and keep moisture from clinging to the inside of the jar.) The dough ball is usually moist inside, lighter in colour and has the consistency of fresh yeast. 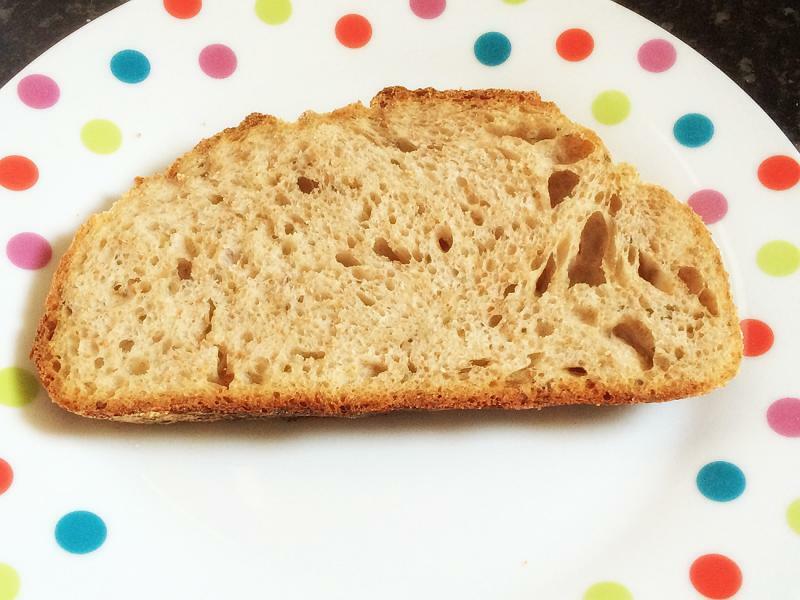 Gluten is long gone after a few months and it has a starchy block feel to it. A great way to back up a starter or store it for period of months or longer. It usually takes me a few days to have it back up and working. When the dormant yeast cells wake up, they overpower the flour yeast and set the culture in the right direction. So it is important not to dilute the culture or overfeed in the first few days. First rehydrate for a few hours then Feed and wait. Once the yeast show themselves, feed them more. Oh I see, I think I saw a video on youtube, the Gentleman burried his * starter ball * in a bag of flour and that * starter ball * had a thick hard outer layer when he took it out, it started to crack , that showed him that it was ready and active. It was a very interesting Video. Hi Petra: Finally got around to trying this loaf. 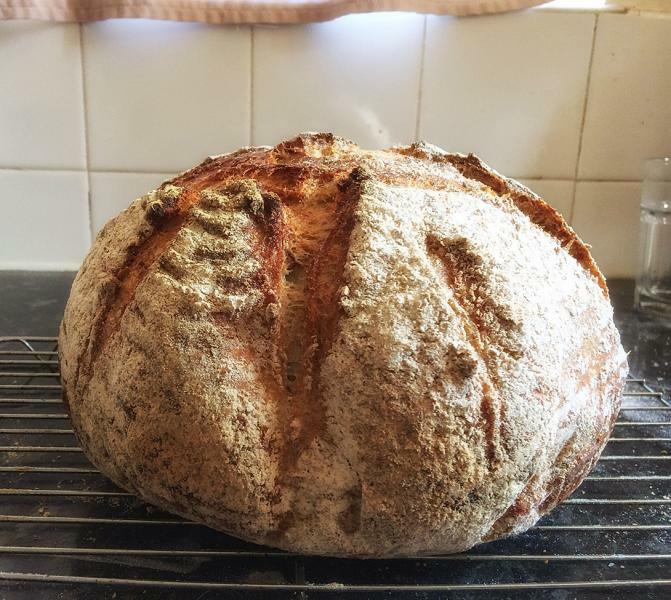 I did not use a 50% starter but a 1-3-4 build (wholemeal). I only made a half volume loaf and tweaked timing a little. I did cold retard the shaped loaf because of time constraints and baked in a DO straight from the refrigerator. Loaf turned out looking very similar to yours pictured above, was very tasty, although a little more sour than I like. 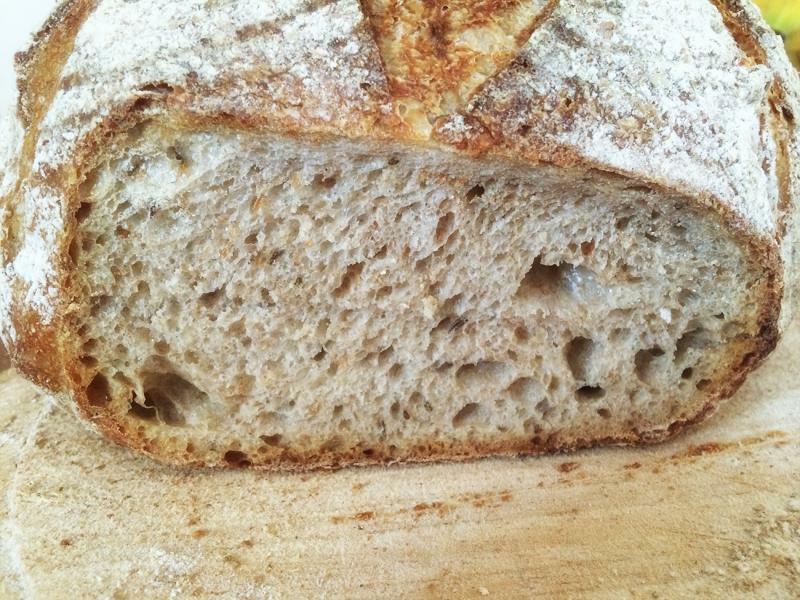 The crust was thin and crunchy and had blistered nicely with open crumb. I guess the cold retard caused the extra sour taste. Will definitely make again. The flour blend was perfect. Good luck with your house move. Hope it goes smoothly and your new range is above and beyond your expectations. I am so sorry Sondra, I did not see your reply. I think a 100% hydration starter will result in a more sour taste. I would love to try it. Question about your timing - you say you do 6 turns over three hours, then you say bulk fermentation is 6 hours. Is that six hours in total or six hours including the three with the turns? thanks. Glad you like it and give it a go.